Sensational, spectacular – and probably the only Coworking space in the world sitting directly on the water. 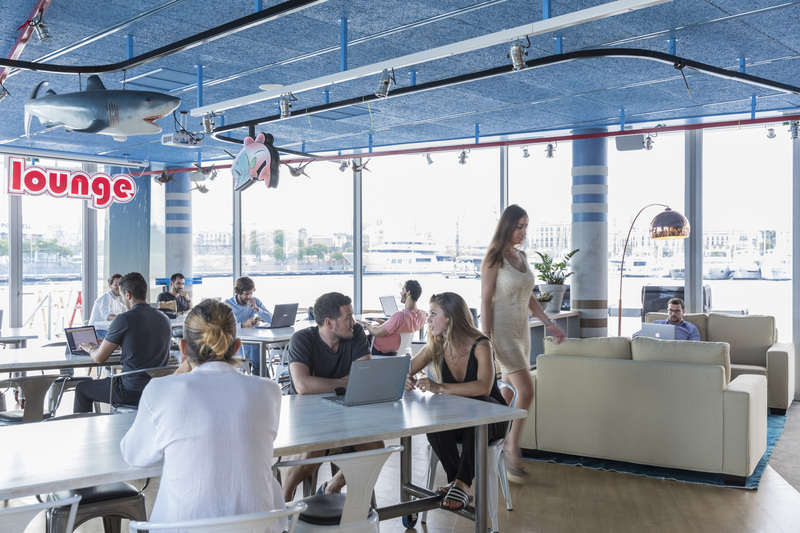 Just a few minutes from "Barceloneta" beach, our beautiful nautical Cowork in Barceloneta boasts unbeatable views of both the city and the sea, as well as a gym and private event space. Our partnership with Harbour Space university brings our coworkers regular business and tech events from world-renowned industry leaders and academics. The best bit though? - The incredible Coworking community of course. Sensacional, espectacular - y probablemente el único espacio de Coworking en el mundo sentado directamente sobre el agua. A pocos minutos de la playa de la Barceloneta, nuestra hermosa obra náutica en la Barceloneta cuenta con inmejorables vistas de la ciudad y del mar, así como con un gimnasio y un espacio privado para eventos. Nuestra asociación con la universidad Harbour Space trae a nuestros compañeros de trabajo regularmente eventos de negocios y tecnología de líderes de la industria y académicos de renombre mundial. ¿La mejor parte, sin embargo? 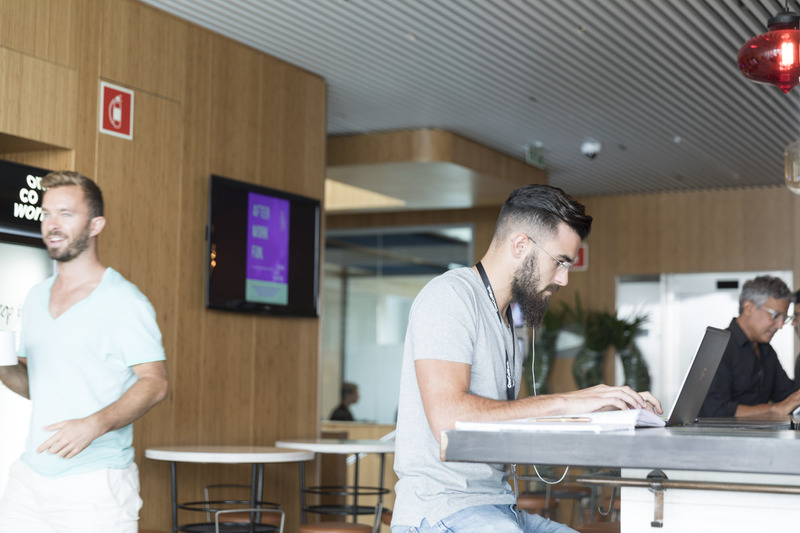 - La increíble comunidad de Coworking, por supuesto. 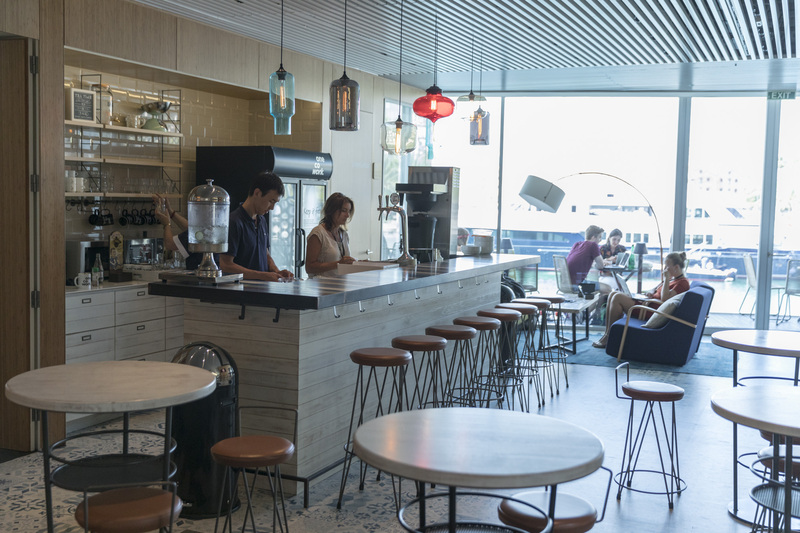 Are you a member of OneCoWork Marina Port Vell? "Best coworking space in town"
I've been working at OneCoWork for several months now, and all I can say is that I would never change that working space for another one. The wonderful location in Marina Port Vell (and that view from the terrace! ), the environment, kind, funny and inspiring people, interesting events and great team definitely makes OneCoWork the best place to work and network! Would recommend it to anyone willing to boost their productivity and having the desire to come at work in the morning. I've discovered the pleasure to set an alarm everyday, knowing that I'll join these people in such a cool place! "Fantastic Space for Business and Networking"
What a great move it was moving into the CoWorking space at the beginning of December 2017 having been in a "traditional" (though also excellent in The Gallery) office space until then. It took some getting used to at first adapting to the new environment but it was definitely the right thing to do. 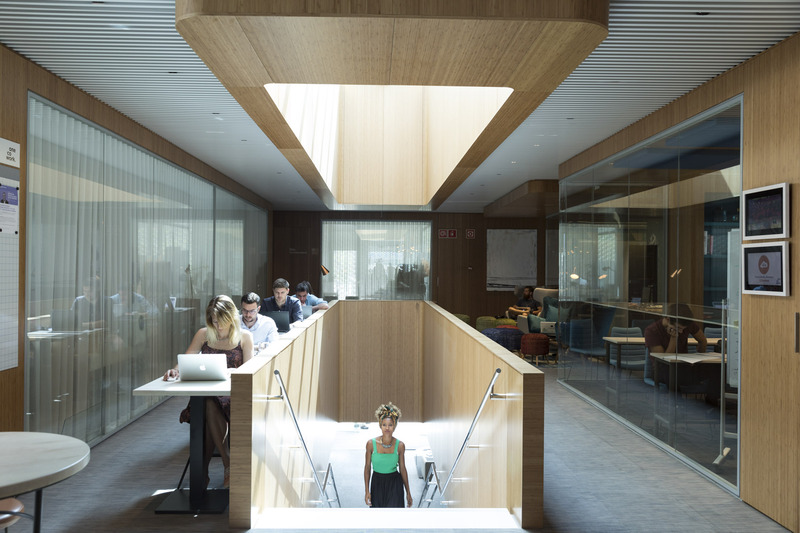 A dynamic space surrounded by people with all kinds of companies and ideas - of all ages. We are still in the early stages of discovering all of the benefits and trying to find the time to attend the constant stream of interesting events that are organised! OneCoWork is a great place to work and network with other freelances and startups! Also they generate amazing community events very useful for any entrepreneur to gain visibility for their projects or companies. The space is 6-star carefully furnished and covering all of your needs (free coffee, events, phone booths, quite areas and social areas, good location, high speed wi-fi....) I would definitely recommend OneCoWork to any people looking for a coworking space in Barcelona. I have heard they are openning a second space in Barcelona, at Plaça Catalunya and looking for new cities to expand their concept of coworking space. Wheather you need a hot desk, a private desk or a personal office, I would definitely recommend OneCoWork. "it's your second home but way better!" ...this would be it. Situated on the harbour of Barceloneta, you probably couldn't get a better location on earth. They even have beer taps in the kitchen that make you think it's beer, but it's actually just water. High-speed Wifi, quiet areas but the ability to easily network in the more communal areas, a gym and million-dollar yatches in the surroundings to help you visualise where you're gonna be in the next 5 years. One of the great things about this place is that you can hit the beach for a swim and a workout half way through the day to chill the entrepreneurial anxiety out. I think I've covered all the essentials. 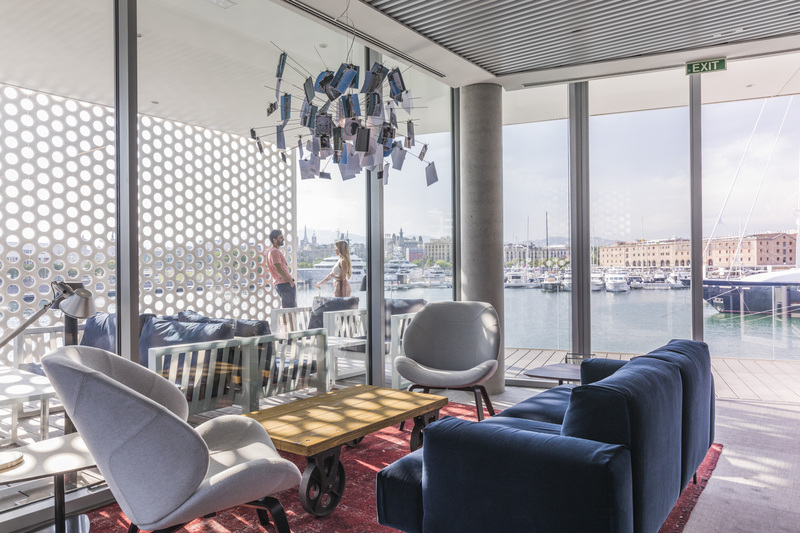 "Jaw-dropping venue, great community and immaculate attention to detail in this Barcelona coworking space"
Jaw-dropping venue in Port Vell, with views of the city. Literally surrounded by water as if you're on a ship - great for meeting clients and getting work done. Exceptional interior design and comfortable seating throughout. Location near the beach is incredible, but if you need to come/go many times throughout the day or you need to be in the city centre regularly it can be limiting as it's located within the marina behind a security entrance. Great community and weekly events always offer something new. Plus, several food vendors bring healthy breakfast and lunch options daily so you never have to leave. 3 terraces with great views, gym and showers onsite as well. "This is the place to be "
One Co work feels like a family where diverse backgrounds meet together and create synergies between companies. Also the events that are held by the community managers at the One Co work space invite team members to feel like home and to be in a friendly and exclusive environment that I personally really appreciate and make me want to wake up from bed every day. Thank you very much for the love and care towards all the co workers. Cant wait for The Plaza Catalunya One Co work to open and to see the Company growing! Keep rocking it! We love you! "Great place to work and network"
OneCoWork is a great place to work and network with other freelances, startups and SMEs! Also they generate amazing community events very useful for any entrepreneur to gain visibility for their projects or companies. Also there is a great atmosphere and the community managers are really helpful. I would definitely recommend OneCoWork to any people looking for a coworking space in Barcelona. I have heard they are openning a second space in Barcelona, at Plaça Catalunya and looking for new cities to expand their concept of coworking space. Wheather you need a hot desk, a private desk or a personal office, I would definitely recommend OneCoWork. "This place is so much more than just a work space." After visiting a few other collaborative workspaces I finally stumbled upon this gem and what a find it was! If you are looking for a place that has the perfect amount of professionalism that you would expect from an office environment mixed in with just the right amount of socialising and fun then this workspace is for you. OneCoWork has it all! An awesome community, a beautiful location, great vibes amongst the coworkers, a comfortable and stylish setup, constant opportunity for social and educational experiences and a warm and supportive staff. These are just a few of the many reasons I love working here. Thanks OneCo for being amazing! "The best coworking space I have ever been to!" Onecowork is a melting pot of creativity and has an amazing vibe. They are young, ambitious and excellent located in the centre of Barcelona. The building has a spectacular view over the port with all the super yachts. At onecowork the only way is up! There are numerous lectures, workshops and events to expand your network or improve your knowledge. Onecowork offers different memberships to your needs. There is a big rooftop, a gym, excelent wifi different types of workspaces, free coffee and so much more. If you are looking for a space to grow your business or work on your projects than Onecowork is 100% the place to be! Here, work becomes a real pleasure. "Best place to work by far"
OneCoWork is such an inspiring place, best location in Barcelona, great services, amazing managing team, active community, definitely THE place to work! Highly recommended to try even for a day! Also, the presentation on thursdays and wednesdays morning (breakfast club) are captivating. Im personnaly fond of Digital Marketing and the presentations I had the chance to be part of were highly quality!! Everyday there are diferent providers for lunch and thats great because we don't have to think on what we are going to eat or where, everything is in house and always healthy and tasty. Thank OneCoWork for being such a great and unique place. "The best coworking space ever"
OneCoWork is the best coworking space I have ever worked in. Having lived in Colombia, Germany and the UK, nothing comes close to OneCoWork’s beautiful location and incredible community. The OneCoWork community managers are truly dedicated to creating the best atmosphere possible, and the fact that the large community is so tightly knit is testament to their work. The facilites are top class, with top rate connectivity and comfort. Even the choice of food for lunch every day is amazing. Honestly i recommend this place to everybody and I cannot wait to visit the next building in plaça catalunya ! "The newest and coolest cowork "
A melting pot of of ideas and cultures- OneCoWork has a great vibe! Young and successful, the members with their own extraordinary stories create and inspire a very cosmopolitan work environment in a city that is making it´s mark as the Silicon Valley of Europe. OCW has also invested a lot of time and effort into organising various workshops and talks for personal and professional development of its members. It has in a short span of time, established itself as a thought leader in its segment through various innovative and creative engagements. The team is courteous and always takes care of the best interests of its members. I would recommend OCW blindly- try it, you wouldn't want to work out of anywhere else but here after this! "ambiance is outstanding and the location is 101 stars." The ambiance is outstanding and the location is 101 stars. Placed in a location with amazing views. Amazing way to meet inspiring people also. I met new people that today are my partners in a company. What more can I say then that! Meeting room to receive clients and make groomings, comfortable desks for the daily work, free coffee and cookies, a beach garden to relax and eat great bbq´s. Un excelente espacio para trabajar y crecer. Una gran experiencia de coworking, junto a muy buena gente! Agradecida del tiempo allí compartido. Ahi nos vemos muy muy muy pronto seguro! "Best location, team and coworkers"
The place is just amazing. There's so much light and you re literally working on top of the water. I met plenty of nice coworkers with great projects. I love the fact that it's so close to Barceloneta beach where I love to fo running and spend some time. As there is a gym inside the building it s easy for me to take my shower there after the run, just before to fo working. One cowork's team is super friendly and the events organized in the cowork are very appreciated. There is a great international atmosphere in One Cowork! "The only Co-Working space on the water front. Literally." OneCoWork is the best Co-Working space I have ever worked at. Period. There is a perfect balance of spaces, busy, quiet, open air, indoors whichever your preference is, they have it, in addition to other useful amenities like lockers, gym and food providers that come at various times in the day to cover for anyone's dietary needs. In addition to this they do a great job in attracting people from all disciplines and parts of the world, so spending time is always a great opportunity to meet inspiring personalities to further enrich one's life with. The location is undeniably one of the best in Barcelona, with perfect sunset views to the marina from the beautiful rooftop or any of the indoor spaces looking on to the water/boats. "Home in a sea of companies"
At Onecowork you don't only have a beautiful office space with amazing views, even just walking to the office makes you happy calm and ready for the day. Also the inside has been designed really nice and efficient, there are silent zone's, not so silent zone's, communal workplaces, non communal workplaces, a terrace in the sun & lovely kitchen with free tea and coffee. They have various workshops, classes and more to make sure you have to opportunity to optimise your working time and gain more knowledge which will improve your company. The office is also the only place in Barcelona where I would leave my belongings without worrying about them being taken, which is very rare to come by. All in all a great place. Throughout my professional carrier, I have had the opportunity to work in different co-working spaces and I must say that OneCoWork is by far my top choice! Its location is absolutely breathtaking with 360 degree ocean views and in a city where the sun always shines. Its members are both friendly and professional, making the working environment just perfect. With regular workshops and lectures, you are constantly offered the opportunity to grow as a professional. If you are looking for a top location with all the right amenities needed to do business and work then this space is definetely for you! 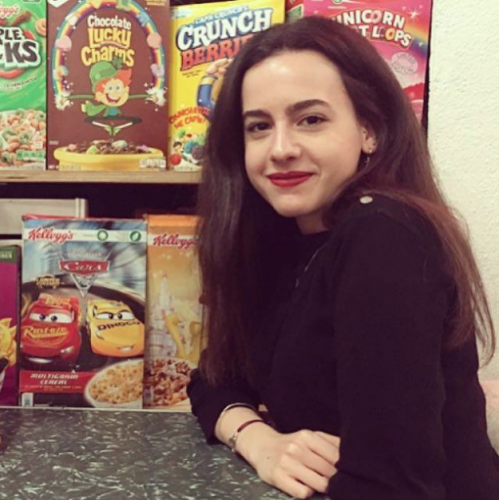 "I feel there like at home"
I'm member of Onecowork and the experience is amazing. The location is excellent near the yachts, not far from the city center, and floating on the water, literally. I really like the growing community with experts of all fields, an of course the inside is fantastic with quiet areas and other areas for doing networking. All the services are provided (coffee, tea, wi-fi, events....) so you only need to focus on your daily work. The team is very professional and always happy to help, they know all of your needs. I highly recommend this place and can't wait for the new space in Plaza Cataluña! "Fantastischer Arbeitsplatz mit toller Aussicht auf Barcelona"
Das One Cowork ist ein hervorragender Ort, um zu arbeiten und zugleich mit vielen interessanten Menschen in Kontakt zu kommen und Kontakte zu knüpfen. Die Lage ist einzigartig und die Ausstattung modern und stilvoll. "A professional team in an ideal and amazing location." Together with my team we had the opportunity to use one of the meeting rooms of OCW for our weekly meeting. The positive surprise started from the vey beginning with the profesional reservation team of the OCW. They helped us to make a last minute booking finding us a great room with daylight and sea view. It was just amazing. Coffee and tea and at our disposal FOR FREE. Great and happy people who gave us a 5star service. 100% recommended. "Stunning location combined with state-of-the-art facilities. You won't regret stopping by!" Uno spazio assolutamente raccomandabile per chiunque voglia lavorare in un ambiente moderno e confortevole. È preparato in ogni dettaglio per assistere i bisogni dei lavoratori ed è fornito con tutte le attrezzature sperabili. Rimarchevoli la compagnia e la comunità. I can't recommend this coworking space enough. The location is fantastic, right on the water in Port Vell, and the space itself is designed beautifully - very cool and stylish inside, with plenty of great terrace areas outdoors. As well as this, the team organise excellent events throughout the week including guest talks, working lunches and after work drinks. Definitely the best coworking space in Barcelona! The location of the coworking is amazing, and the crew had a very great understanding of the coworkers needs. Sometimes instead of going on holidays during the weekends or on August I just come to the coworking to work and swim near the yachts. Definetly the best Coworking space in Barcelona, The space is incredibly inviting to work and have business meetings, Everyone from management to employees are always willing to help and come out with great ideas to boost the interaction between coworkers, from afterworks to boatrips theres activities for every taste. and the location........ Priceless ! "Even if I had my own premium office space I would still work here. " Everything you would want in a working environment. A profesional and respectful space full of dynamic and very friendly members. A really comfortable setup with plenty of cultural and social activities and opportunities to grow, meet new people and learn. Don't be shy. Introduce yourself to people - there is always something interesting going on! Go hang around the kitchen and say hi. Make an effort to attend the events and you will be settled in in no time !! If you want to know your fellow co-workers, hang around after 6 on Thursdays for After-work Beers. A great place to socialise, connect and grow your network. Go running with the Sunrise runners of Barcelona before to go to work. It helps you to begin your day full of good energy! Great working environment with beautiful views in the center of Barcelona! Amazing views, great facilities in a dynamic environment with a lot of networking. There are some food options around the neighborhood. Try La Cassola, Rumbanroll or Poke Maoli for take-away options and enjoy your lunch on the rooftop of OneCoWork or on the beach. OneCoWork Marina Port Vell too? OneCoWork Marina Port Vell will be in touch with you soon to confirm. OneCoWork Marina Port Vell has received your membership enquiry and will be in touch with you soon.